Collect your favorite Marvel characters as adorably stylized mini-figure key chains! This Marvel Series 8 3-D Figural Key Chain Display Box is a must-have for the Marvel collector in your life. You could get Classic Dr. Strange, S.H.I.E.L.D. Agent Maria Hill, the Kingpin, Quake ( Agents of S.H.I.E.L.D. 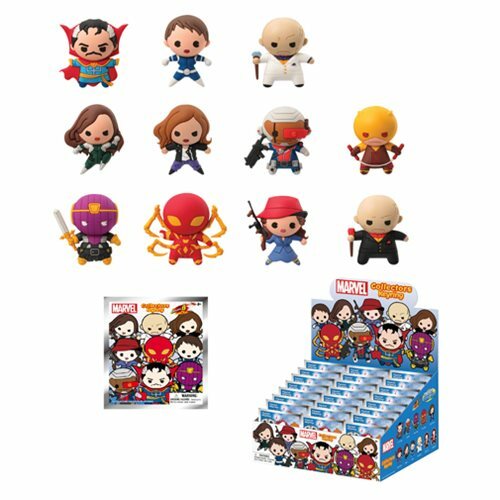 ), Jessica Jones as Jewel, Deathlok, Baron Zemo, the Iron Spider, Agent Carter, or special rare chase versions of Daredevil in his original suit or Kingpin in a black suit! Ages 4 and up.